Disney is owned by people like Robert A. Iger, chairman and chief executive officer (CEO) of The Walt Disney Company, since 2005. Others like Jack Dorsey, Twitter co-founder, and Sheryl Sandberg, COO of Facebook won’t probably seek re-election as board members, as companies like Twitter and Facebook have become way more media companies than they used to be. 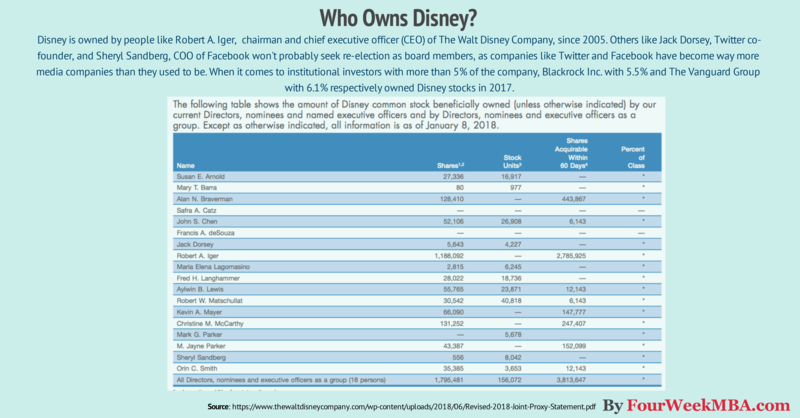 When it comes to institutional investors with more than 5% of the company, Blackrock Inc. with 5.5% and The Vanguard Group with 6.1% respectively owned Disney stocks in 2017. As The Walt Disney Company was founded in 1923 it had also a long history in terms of stock ownership. It is interesting to revisit the story of how Steve Jobs owned almost 8% of the company got for a few years. Why did Steve Jobs own Disney stocks? Everyone knows Steve Jobs’ story. For those who don’t recall it. In 1985 Steve Jobs was ousted from Apple. That was mainly due to the lack of success of his last product and the fact the company needed to take action to avoid consequences on the bottom line. When Jobs was ousted he didn’t take it “sportingly,” and he sold all of his stocks of Apple back then. I covered in “Who Owns Apple,” how Jobs used those stocks to purchase Pixar. And with his genius, Steve Jobs managed to make Pixar become among the most innovative companies in the world until Disney acquired it. That is the conventional story that praises the genius of Jobs. I’d like though to report the story told by Alvy Ray Smith on his blog. This is his perspective on those years as founder of Lucasfilm, the company that would presumably sell Pixar to Steve Jobs. In reality, Alvy Ray Smith seems to tell us another story, which doesn’t picture Steve Jobs as the visionary we all know. It is important to remark this is another side of the story that can be hardly confirmed or refuted. However, I invite you to read it yourself on Alvy Ray Smith blog. He has there documents that seem to be genuine. Here I’m noting a few critical points. In short, he is arguing that Steve Jobs is an “investor,” not the “buyer” thus the one who runs the company. In fact, in the same article, Alvy Ray Smith continues “Ed Catmull, and Alvy Ray Smith were the management of Pixar. Steve owned 70% of the new company, the management and employees the other 30%. Ed, Alvy, and Steve were the board of the corporation. Again, this was not a “buy” by any stretch of the definition. The implication of “buy” is to “own and run.” The implication of “invest” is to own an interest in and let managers (ultimately responsible to the board) run. Pixar was of the second type. Use of the term “buy” is a marketing ploy to make it seem that Steve was the single inspired genius who had all the ideas of Pixar and made it work. That’s not how it worked. Not even close. No, it didn’t. Jobs did not come along and pour money into a dying company and save it, as is sometimes depicted. Pixar was failing despite his money which was the only money the company had. That is, the company built from scratch with Jobs’s investment was the company that was in trouble, DESPITE Job’s financial involvement. It was failing as a hardware company. What saved Pixar was Disney’s asking it to make a movie. That wasn’t Jobs’s idea at all. In fact, the idea all along (Ed and Alvy’s idea) was to keep the company alive with hardware manufacturing as long as necessary to reach the next stage in Moore’s Law, when computing a movie would become feasible, then make movies. Jobs invested in that initial hardware company. He ran another hardware company, Next, at this time. Hardware was what he knew, not animation. The company ran out of money several times in the initial hardware days. Jobs poured more money in to cover the losses each time. It’s sometimes construed that he did this because he saw the long-term potential of the movie business and held on to “his vision” with further investments. This wasn’t the case at all, however. Jobs kept pouring money into the company so that he wouldn’t have to sustain the embarrassment that his first company – after being booted from Apple – was a failure. The result is the same: His money kept the company afloat, but the idea that it was his grand vision is not right. In fact, he would have sold the company to ANYBODY for $50 million (to cover his total investment) during that pre-movie period. The company (Ed and Alvy, in particular) wrote several business plans during those years for just that purpose. They all failed to attract a buyer. Jobs would have bolted if he could have without embarrassment. What Jobs WAS good at was seeing the grand opportunity when it appeared, and moving fast to take advantage of it. That opportunity wasn’t Disney’s approach in 1991 to the company to make the movie. It was when the completed movie, over three years later (late 1994), was taken to New York City and the critics went wild, saying it was going to be a smash. THEN Jobs quickly stepped forward, pushed Ed Catmull aside as apparent head of the company, and took brilliant advantage of the opportunity to take the company public, cover his investment finally, and make it appear that it had been his idea all along to do it this way. He was a marketing genius, including self-marketing. It was Disney’s money that saved Pixar. They paid for the production of Toy Story, which went on to great success for the company. Animated movies were Pixar’s vision, from its earliest days at NYIT on Long Island, not Jobs’s vision. Why Twitter had Jack Dorsey as a board member? However, as Twitter has become over the years a media company, Jack Dorse won’t probably be re-elected as a board member as conflicts of interests loom ahead. Why Twitter had Sheryl Sandberg as a Disney, board member?